I haven’t told my husband yet, but I have a boyfriend. If he knew, he would be more bewildered than anything else. Actually, the boyfriend would be pretty bewildered too. Because he doesn’t know he’s my boyfriend. I have never met the man. I have never even been in the same room with him. He plays the guitar. He is American. He is male. That is as far as I can get before I become embarrassed and can’t talk about him anymore. But I listen to him every day, while I’m running on the treadmill. That is our time. You probably think I’m talking about John Mayer, because he is a big American guitarist who also happens to be male. No. I would rather gouge my eardrums out with rusty scissors than listen to that man on my beloved treadmill. John Mayer is greasy stir-fry left to cool on a dirty countertop while the waitress picks her toes. Sorry, if you are a John Mayer fan. Yes, I know you think he is talented. (I did not add the photo directly to the post because Karen says that’s stealing. So you have to click on the link. Sorry). I look through photos of him sometimes to calm me, when I am procrastinating from doing something vitally important. My editor is really pleased about that. Jack White is probably the reason why my book will never be published. That is OK with me. I have several “favorite” photos. One is my absolute favorite because he is staring at the camera with the same skeptical expression I imagine he would use if he ever actually met me. Like he is a heartbeat away from calling security. KAREN: He looks like he’s on his period. Oh, Karen. Maybe it’s a good thing we have vastly different tastes on these matters. She is an aberration, an outlier. But then I show my friend Patrick a photo over dinner, because I am back to being 11 years old and boring my friends at the lunch table about Duran Duran. I feel like we are in an Alice in Wonderland world where Justin Bieber is a real catch and Adam Levine is a major league heartthrob who is not creepy in the slightest. What is going on? Why are people going on about things that are obvious and completely, utterly simplified, the tom yum noodle versions of humanity? There is no subtlety in a bowl of tom yum noodles. It doesn’t really require a lot of extra work to do well. Sometimes, all you need are the tom yum seasonings from a pack of instant noodles added to a bit of pork broth, and there you have it. Britney Spears in a bowl. For my money, when I go anywhere, it’s all about yen ta fo. If you read here regularly, you already know about my fondness for them, but they really are my favorite soup noodles in the world — more than snoretastic pho, more than tired old ramen, and don’t even get me started on those poseur minced pork noodles, the Fall Out Boy of street food. Yen ta fo is hard to describe: plain rice noodles dressed up in a pork broth-based sauce liberally touched with red fermented tofu and chilies, pork and fish meatballs, bits of squid and congealed pig’s blood, and a whole handful of blanched morning glories. The very best bowls have deep-fried bits of pork crackling and garlic as garnishes. Through some strange culinary alchemy, these ingredients should all combine into a melange that is somehow spicy-tart-salty, and only a little bit sweet. Every bite shows something different, depending on what you get. It’s not always perfect or even good, but then again it’s not about making choices that are easy or simple. 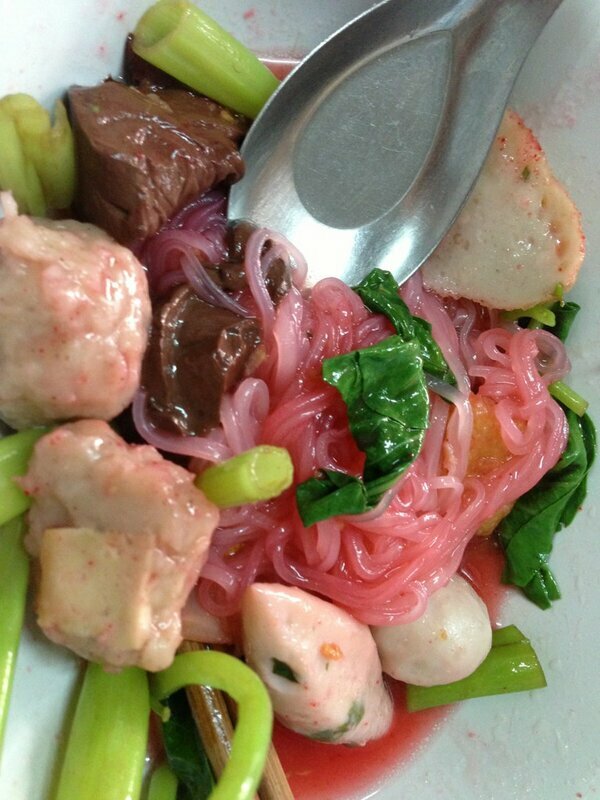 The best bowl, the one I go to the most frequently when I want this dish, is Guaythiew Pik Gai Sai Nampung on Sukhumvit 20/1 (the alleyway between Sukhumvit Sois 20 and 18). This place is actually known for its chicken wing noodles, which can be too salty for some (present-day Eddie Van Halen). I prefer the “red seafood”, which may not, at first glance, look like what you’ve been waiting for, like that thing that will see you through an hour and change on the treadmill every day. But that just means that there’s more for me. Hahaha! You’re ridiculous and awesome and write things that make me simultaneously laugh out loud and drool. I said you should embed the photo by using its URL rather than uploading an illegally download copy. When you go to “Insert Media” you get an option to upload a photo or add it by URL. I’ll show you how in a couple of weeks. I’ll be the haggard woman in the elastic pants at baggage claim. Thanks! I didn’t really get it when you tried to explain it to me. Thanks for the post. If you want to find and embed pics that are in the public domain (even Mr. White is there! ), you can use creative common’s search engine (I won’t post the link here – it might be identified as spam, but you can google it). It’s a great tool – all you need to do is give credit to the photographer. I think NZ is still trying to set up an exciting dining scene without too obviously aping Australia or Europe…it will be a ways to go before ethnic food really finds its footing there. They are only just discovering Korean! If you could teach me how to do the soundtrack, I would totally do it.